We had only lived in Utah a short time when my husband and I read an article in Sunset Magazine, touting the west’s best taco joints. It turns out that the joint with the “west’s best taco” was a mere ten minute drive from our house. Score! Quite simply, Lone Star Taqueria is the home to the best fish taco I have ever eaten. Apparently, we are not the only ones who agree with that magazine article. When Guy Fieri and his Food Network crew of Diners, Drive-Ins and Dive descended upon the small lime green building, they praised both the funky, bumper-sticker covered car permanently parked on the lawn of the restaurant and the simple, authentic menu items. The fish used for the tacos at Lone Star Taqueria ranges from tilapia to salmon to mahi mahi. Whatever fish you choose to use, do your best not to overcook it. Lift it out of the pan just before you think it is done and you will end up with tender, moist pieces of fish. Add in whatever “extras” your palate desires – avocado, tomato, slaw, salsa. But I beg of you…do not leave out the creamy green chile and cilantro sauce. This recipe I came up with is not an exact match to the restaurant’s version, but it is pretty darn close. It is so good I would consider trading in a wedge of Brie for a container of it. That is serious stuff. If you make the sauce and spice mixture ahead of time, this is a dinner that can be prepared quickly. Store the sauce in an airtight container in the refrigerator for up to a week. Any leftovers from the tacos can be used for dipping veggies or chips. 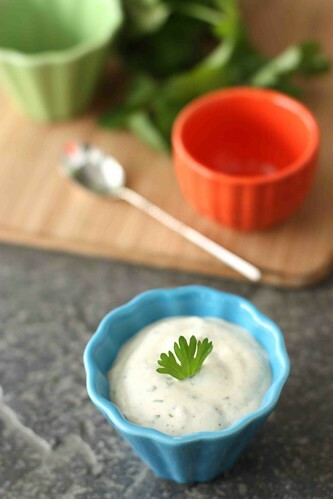 In the bowl of a food processor, puree mayonnaise, sour cream, milk, diced chiles, lime juice, cumin and salt until smooth. Add cilantro and pulse until just combined. In a small bowl, mix chili powder, cumin and salt. Pat the fish fillets with paper towel to remove excess moisture. 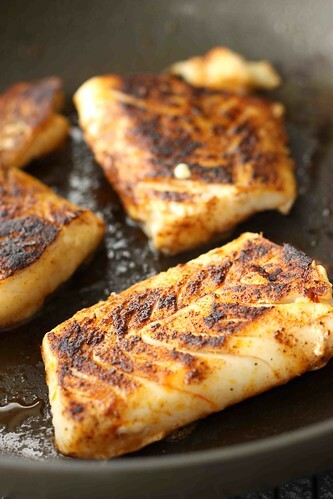 Rub both sides of each fish fillet with spice mixture. Heat canola oil in a large nonstick skillet set over medium-high heat. Add fish fillets and cook on both sides until fish is just opaque. The time will vary depending on thickness of the fillets. The mahi mahi fillets I used took about 4 minutes per side. Remove fish from skillet, let cool slightly and gently pull apart with your hands to form strips. Wrap tortillas in foil and warm on lowest setting of the oven. Using 2 corn tortillas for each taco, fill with fish, cheese, cabbage, tomato and desired amount of sauce. Serve. These sound super tasty! Great recipe…again! These look so amazing! I love the photos! Wow…..now I REALLY want Fish Tacos!! Thanks, Jessica. I’ve had a craving for another batch of these all day. fish tacos look great and the Creamy Cilantro & Green Chile Sauce….wow, now we’re talking! i love dips and sauces of all kinds! Thanks, Averie. I feel the same way – if the dip or sauce is good, then the dish holds a lot of promise. 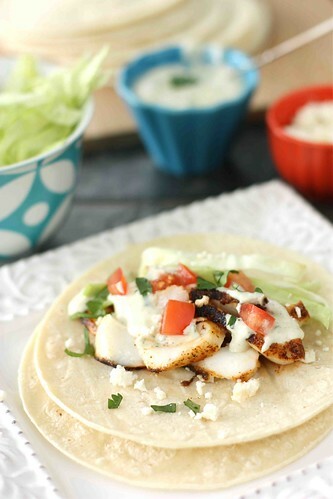 i love creamy sauces on fish tacos…this one sounds amazing! i love the flavor of green chile and cilantro together! A Creamy sauce is definitely the way to go with fish tacos. They’re just not the same without it. I can’t believe I’ve never had fish tacos before…and that cilantro sauce sounds amazing!! any tacos with corn tortillas are a-okay with me! Those are always the best. 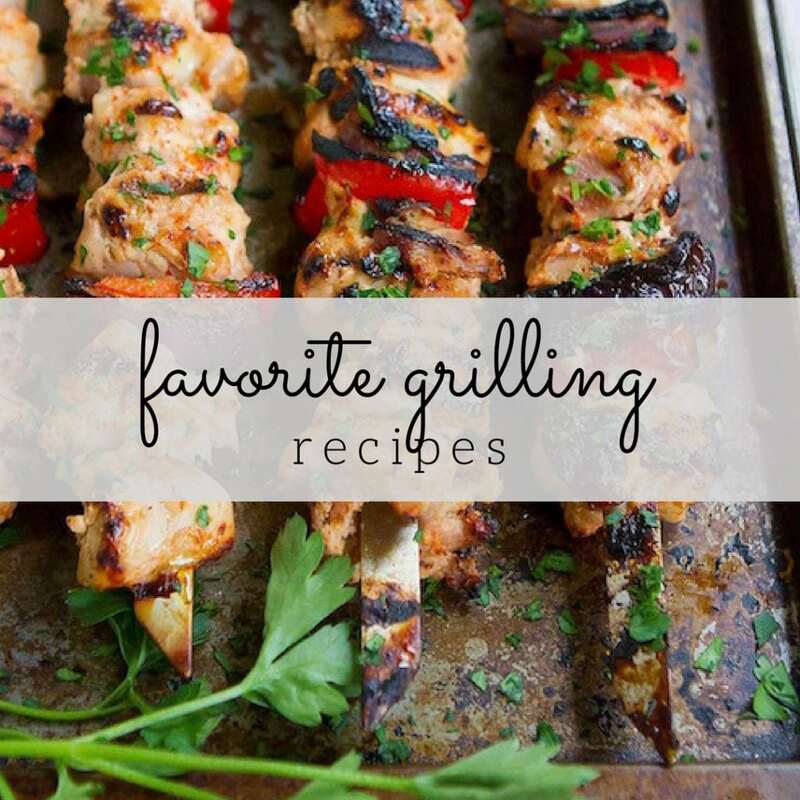 These look delicious – the perfect light dinner for spring. These fish tacos look great. I love reading articles about the “best” of something and actually getting to try it. Recreating the recipe to match the original, even better. I would love the creamy cilantro and green chile sauce. That sounds amazing. Yummy! What perfect little fish tacos! Love everything about them! If they taste anything like they look, then WOW. I’m a huge fish taco fan– have plenty of recipes for them on my site, but now it looks like I have to try another! Thanks, Lori. Yes, you have some great ones on your site that I’m looking forward to trying. Mmmmmm………. The Lone Star is without a doubt my favorite place to eat when I’m in Salt Lake. And you’re right- the sauce is the best! Let’s plan on meeting there for lunch someday. Josh loves fish tacos. These will be great during the hot summer months! I know you and Josh love Lone Star as much as we do. You just can’t beat their fish tacos. Just delicious Dara! Isn’t it fun when the best restaurants are in your own backyard? I’ll be giving this one a try! Yes, I was so excited to be able to try this restaurant. It’s now one of our favorite casual dining places. These look great! I recently tried fish tacos a few weeks ago for the first time. I’m looking forward to giving these a try. All your recipes have turned out fantastic! Thanks so much, Asiya. I hope you enjoy this one, too. Sounds so delicious about now even though we’ve had quite a bit of Mexican food lately. I’ll have to try that sauce. The taco stand sounds great too — even though I think San Diego always gets a bad rap in that area. There are so many great places here that make fish tacos. I can imagine that San Diego is packed with great fish taco places. I’ll have to ask you for some recommendations the next time I travel there. True confession? I have never made my own fish tacos. Even worse? I love the ones at Del Taco (please don’t hate me but it’s true!). You’re too funny, Barb. Give these ones a try – they’re easy and I’ll bet they can rival your favorites. I agree, Lana. So far, I’ve eaten it on quinoa, tortilla chips and straight off of a spoon. Fish tacos is one of my favorite meals!!! Me too, Kelsey. They’re such an easy meal for a busy weeknight. Made fish tacos the other night. Wish I’d had this recipe. The sauce sounds amazing. Thanks, Rose. I hope you give it a try next time. I love fish tacos, but its really all about the sauce! You had me at Fish Tacos – one of my very favorite dishes of all time. These look fresh-tasting and beautiful. Thanks, Donna. We’re big fish taco fans here, too. fish tacos are my favorite! these look perfect as do the others you linked to! Thank you, Kristina. Yes, I want to try each of those recipes I linked to. I’ve never been to Lone Star Tacqueria (no idea where it is even!) I can tell I need to get out more. Or get you to come over and make fish tacos for me, one or the other! Kalyn, I would be more than happy to come over and make you some fish tacos. However, if you ever want to try Lone Star’s version, it is on Fort Union Blvd., about 1/2 mile east of 2000 E.
OK, you got me with the sauce, darn ya! Loving and bookmarking for the weekend! Okay that does it. You have to come visit so that we can spend a week just playing with seafood 🙂 NUM!! I’m so happy to have stumbled upon your site. 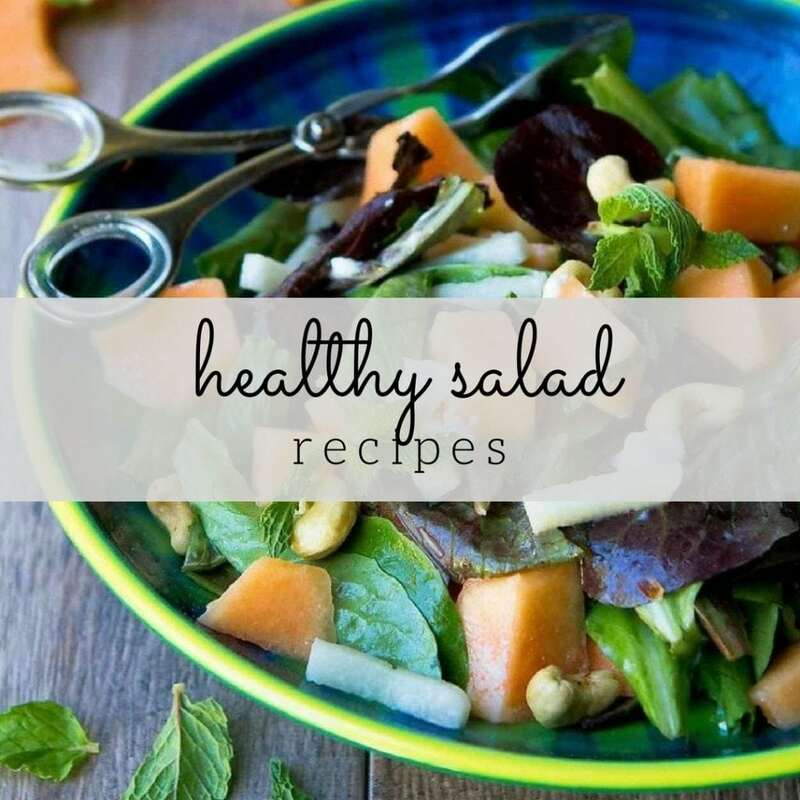 Beautiful photos and lovely recipes! This looks so refreshing and delicious. That fish is making my mouth water! This reminds me of when I lived in San Diego, fish tacos are the specialty there! I love your site and this sauce looks amazing. I’m kinda confused by using TWO tortillas for each taco? Have I been missing something all my life?? Kerri, I meant to explain that in the post. We find that the tortillas start to break apart if we don’t double up. Actually, we first got the idea to do this from the Lone Star Taqueira that I reference in this post. As much as I love fish tacos, I’ve yet to make some. I must try this recipe! These look divine and so simple too! I think I could drink that sauce! Holy moly…sounds so good. I bet that green chile sauce is the key! Dara these look so fresh and amazing, like a could just grab it off the screen! I love fish tacos. I normally have it simply with a squeeze of lime, although your sauce sounds really good. Will have to try it next time I make fish tacos. LOVE this idea! Dara, you know we love you right? Really fresh post! Fish lightens up the taco and that sauce sounds delish! 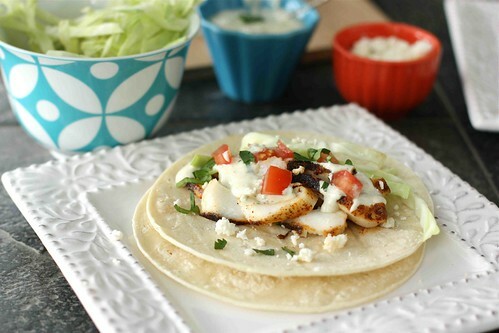 I’m just catching up on posts on Stumble upon and these fish tacos caught my eye. I think we posted similar recipes on the same day. 🙂 I used mahi mahi, too and used the same seasonings. Of course, your photos are infinitely better than mine, though. I’ve had fish tacos many times in restaurants, but have yet to try making them on my own–I think I need to give this one a shot–they look amazing! Delicious! Fish tacos always make a great meal! Fish tacos are such a delicious and healthy alternative to the usual meat-based ones! And with all those lovely toppings they’re just as satisfying. I hadn’t come across that cilantro sauce before but it sounds fantastic! I love fish tacos and this fish looks so good. I bet with the sauce, it’s a perfect dinner!! We LOVE Lone Star… especially when we can sit out on the patio. Never mind that it’s a 45 minute drive both ways for us to get there! Their fish tacos are the best in Utah by a mile… except when they serve Red Snapper, which is a bit fishy for me. If it’s Snapper, then I order the “Taco the boys eat.” I don’t know what it’s really called, but when I order it they seem to know what I’m asking for and, I get a delicious taco with Carnitas and sauted diced veggies which is totally divine too. Thank you for being such a wonderful inspiration over and over! 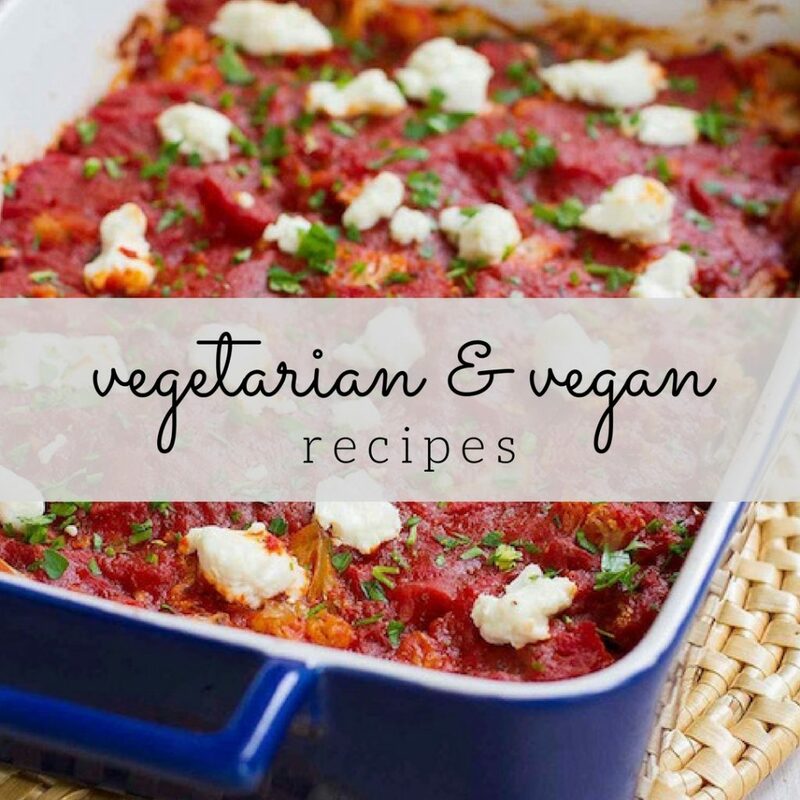 I am so excited about this recipe – we are making it this weekend! And I fixed my typo (eek!) Thanks SO much! I LOVE fish tacos, these look amazing!!! Making these right now. Just waiting for my bf to get home so I can throw the fish on and eat them! I made the sauce and it tastes so yummy just by itself. I’m using yellow eye instead of my norm halibut. Can’t wait for it to be in my belly! Thanks for sharing the recipe. these were really great! i substituted plain yogurt for the sour cream, tilapia for the fish, and one chipotle pepper (adobado) for the can of green chiles. turned out delicious. I used cod and shrimp for this recipe and it was fantastic. The sauce is really delicious, I put it in the refrigerator for an hour or so for a thicker consistency.